A silent predator is stalking companies all over the world. 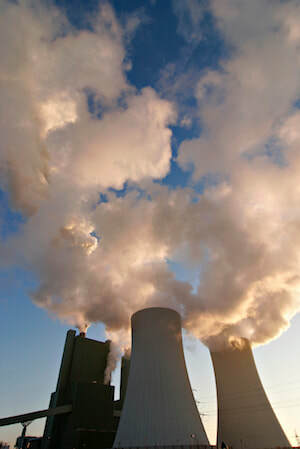 Triggered by humidity, oxygen and other elements in the atmosphere, it's called corrosion and each year it costs hundreds of millions of pounds in corporate profits. Corrosion is a natural process in which refined metals attempt to return to their natural state. The more energy used to refine the ore into metal, the faster the metal will corrode. Corrosion is an electromechanical process. The presence of a tiny amount of electrolyte on an unprotected surface of a metal can cause electrons to flow from a higher energy area (anode) to a lower energy area (cathode). This initiates and sustains corrosion. Machined metal parts have microscopic peaks and troughs on the surface that in effect expose more surface area to the electrolyte. This causes corrosion to occur more rapidly. Corrosion will occur when both oxygen and moisture are present in the right proportions. Remove one of them and corrosion won't happen. Contamination of a metals surface with industrial pollutants such as sulphur dioxide (often associated with the burning of coal, oil and gas) or process contaminants found in machining fluids, will create corrosion. A further cause for exported goods is what can be termed as 'Packing Case Corrosion'. Wooden containers can release highly corrosive acetic acid vapours and timber treated with fungicides and insecticides can introduce other sources of acid corrosion. Corrugated cartons are also a potential risk as, under certain circumstances, the glues that are used also produce corrosive vapours. There are many forms of corrosion and Technology Packaging can help in analysing its cause and stopping it from occurring again. We have a Literature Fulfilment on this site which is a source of technical and product information. There are some other technical documents, with new articles being added, that can be downloaded. These will assist you in understanding the problems therefore helping you to make decisions in the future. If you require any further information or assistance on your particular corrosion problem please visit the Contact Us page.